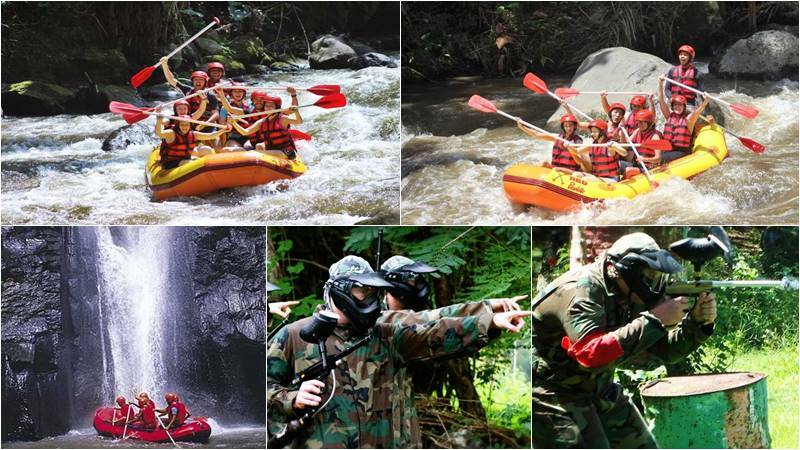 Bali Rafting + Bali Paint Ball tour is an interesting Bali Rafting tour package where you will enjoy Bali river rafting at Ayung River then combining with Bali PaintBall. Our games with full of fun in a cool, green and beautiful 1 hectares field in the rural area of Bali village. In this adventure sport you will have experience in competing individually or in teams to eliminate opponents by tagging them with capsules containing water soluble dye. We are pleased to invite all our distinguished guests to try out our fun games on a cool, green and beautiful1-hectare field in Bali village’s rural area. You will be able to compete individually or in teams with this adventure sport, by tagging it with capsules containing water-soluble dye and gelatin shell outside (paintball),propelled from device (paintball gun). This game rules include: capturing a flag, elimination, defending or attacking a particular area, capturing object of interest hidden in the playing area or releasing a hostage. In this game, you can show your tactic to be a winner. The expert team complements our adventure to ensure your safety and satisfaction. Ticket for Bali PaintBall with all equipment.